George Graham reviews American Football's "American Football [lp3]"
Some bands have a slow and steady approach to their careers, building their audience through constant touring and recording. And there are the one-hit wonders, artists and groups that make an impact that for whatever reason, does not turn into a durable career. And sometimes, bands come back after essentially disappearing from the scene. This week, we have the new recording by a group of the latter category. They are called American Football, and their new, third release, like all of their previous albums is also called American Football, but the designation “LP3” has been added to this release, to allay confusion. Southern Illinois-based American Football got its start when Mike Kinsella and Steve Holmes became acquaintances and played together in high school in Wheeling, Illinois. They worked together while attending the University of Illinois at Champagne-Urbana, joined by Steve Lamos, and recorded an EP as American Football in 1998, and then released a full album in 1999. By then, there were essentially a recording-only band. After the release of their album, the members went their separate ways, living in different parts of the country, in one case moving away to take a job to help pay off student loans. But their debut release become a kind of cult favorite, thanks to the Internet. So seventeen years after band stopped recording together in 1999, they reunited for an album in 2016, also called American Football, which we featured on this review series. The group combined elements of alternative rock with some of the musical sophistication of progressive rock. They have gone back to being a band together, and now have released their third full-length recording, also American Football (LP3). On the new release, the band has stepped up their game quite a bit. As on their last album, there’s lots of atmospheric, almost chiming guitars. The new recording features more complex musical compositions and arrangements, often with tricky changing meters, that nevertheless fit well with the sonically flowing music. Their lyrics tend to be impressionistic and rather opaque, but they fit well with the atmospheric quality of their music on this album. While previously very much a self-contained group, American Football is joined on the album by three guest vocalists who appear on as many of the tracks. Also in the progressive rock tradition, several of the pieces are on the longer side, at about seven minutes or so. The musical quality, in the context of ethereal rock, is especially high, with the compositions having a combination of interesting musical elements and an appealing, atmospheric sound. American Football has gone from being initially a part-time band, to an inactive one for some 17 years, to one that came back together on the strength of internet interest in their previously obscure initial release. 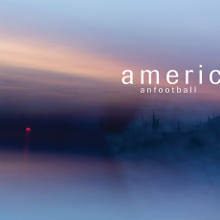 On their new third album, American Football (LP3), the band has gone all in for creative, sophisticated music that hints at the complexity of the progressive-rock scene, with some of the ringing guitar sounds of the 1990s, some of the atmospheric quality of the so-called “shoe-gaze” groups, but at a much higher level of musicianship than most of that genre. The compositions are musically creative, and the poetically vague lyrics are often intriguing. The new album is by far their best. Our audio quality grade is about an A-minus. The atmospheric sound is nicely reflected in the mix, the elements have good clarity and an honest sound. But the loudness was jacked up by squeezing the dynamics, with the softer parts just as loud as the louder passages. But unfortunately that is all to common. American Football is a hard band to characterize. They borrow from a lot of elements of rock from the last 40 or so years. But the result is a pleasing, but sophisticated album that seems to reveal something new at each listen.